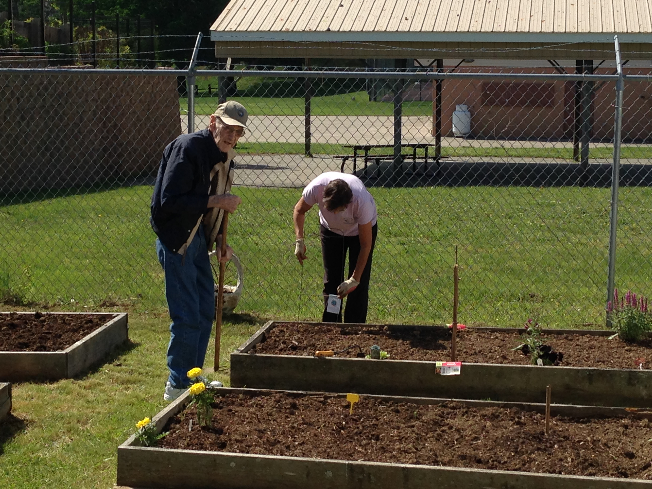 You are here: Home / News / Parkesburg / Parkesburg Library / Parkesburg Goes Gardening! The club meets each Saturday morning from 8 a.m. to 10:00 a.m. and more often if needed. Each participant has gotten a raised bed to plant and maintain throughout the growing season. I also make myself available for advice during these times for anyone in the community that wants to stop in and as a garden, lawn, or pest question. If I can’t answer the questions on the spot I have the resources of the Penn State Extension Program and the home program in State College. We started with 7 participants and we have since added another 2, not counting me. Participants range from 8 years old to 86 years old. We have a family of 4 coming from East Fallowfield, one from West Minster Place, one from Freedom Village and three participants from Parkesburg. We started out by cleaning up the entire area around the raised beds. Then we cleaned the beds all out thoroughly and added organic matter to enrich the soil. Most of the beds are a mix of flowers and edibles. We have annuals and perennials. Week two has come and gone now and we are really seeing progress. Fred put up a trellis for his beans this week and Edith has some good looking tomatoes and peppers going. The group is keeping a close eye on our Amaranth plants. We have 6 of these beautiful specimens and we’re all anxious to see how they do. Every part of the Amaranth plant is edible. The seeds are used most commonly, but the leaves, stems, flowers and roots all have culinary uses. We had a furry black and white skunk dash out from under the shed last week so we have our first pest challenge to deal with. Over the next month we’ll be laying field stone for a sitting area and doing some nice border planting to really make the gardens a relaxing and inviting area for library patrons to visit. As the produce starts to come on we intend to share with those in need. We’re just getting started, but things look good and we’re looking forward to a very productive season. Top image is Bobbi and Jim Taylor with their daughter Ava and son Jimmy. Fred Kenworthy and Linda Jones.